Step 1: Determine how much of each supplement you need to use and combine supplements together. Open the capsules and pour out the desired amount into a bowl. Step 2: Take the back end off your syringe and fill about half way with water, broth or "soupy liquid pet food". Squirt this into the bowl with the powder. Mix until the powder is dissolved in the liquid. 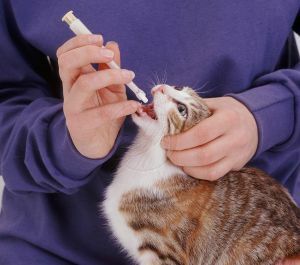 Step 3: Syringe the mixture back up and into your cat's mouth. Please note these simple instructions apply strictly to Ask Ariel supplements for cats. Many medications and other vitamins may not be able to be combined. Please always check with your veterinarian about the correct way to administer medications.